By analyzing fossil evidence from skeletons, eggs, and soft tissue of birdlike dinosaurs and primitive birds, a newly published study from Harvard scientists shows that birds are essentially living dinosaurs and provides an example of how developmental changes played a major role in the origin and evolution of birds. It’s hard to see how a common house sparrow and a Tyrannosaurus Rex might have anything in common. One is a bird that weighs less than an ounce, the other a dinosaur that was the size of a school bus and tipped the scales at more than eight tons. For all the differences, though, scientists now say that those two are more closely related than many believed. A new study led by Harvard scientists shows that birds are, essentially, living dinosaurs, with skulls that are remarkably similar to those of their juvenile ancestors. As reported in a May 27 paper in Nature, Arkhat Abzhanov, associate professor of organismic and evolutionary biology, and Bhart-Anjan Bhullar, a Ph.D. student in Abzhanov’s laboratory and the first author of the study, found evidence that the evolution of birds is the result of a drastic developmental change. Rather than take years to reach sexual maturity, as many dinosaurs did, birds sped up the clock — some species take as little as 12 weeks to mature — allowing them to retain the physical characteristics of baby dinosaurs. While it’s clear simply from looking at the skulls of dinosaurs and modern birds that the creatures are vastly different — dinosaurs have distinctively long snouts and mouths bristling with teeth, while birds have proportionally larger eyes and brains — it was the realization that skulls of modern birds and juvenile dinosaurs show a surprising degree of similarity that sparked the study. To tackle the problem, the researchers turned to an unusual methodology. Using CT scanners, they scanned dozens of skulls, ranging from modern birds to theropods — the dinosaurs most closely related to birds — to early dinosaur species. By marking various “landmarks” — such as the orbits and cranial cavity — on each scan, researchers were able to track how the skull changed shape over millions of years. What Abzhanov and colleagues found was surprising — while early dinosaurs, even those closely related to modern birds, undergo vast morphological changes as they mature, the skulls of juvenile and adult birds remain remarkably similar. In the case of modern birds, he said, the change is the result of a process known as progenesis, which speeds up an animal’s sexual development. Unlike their dinosaurian ancestors, modern birds take dramatically less time — just 12 weeks in some species — to reach maturity, allowing birds to retain the characteristics of their juvenile ancestors into adulthood. 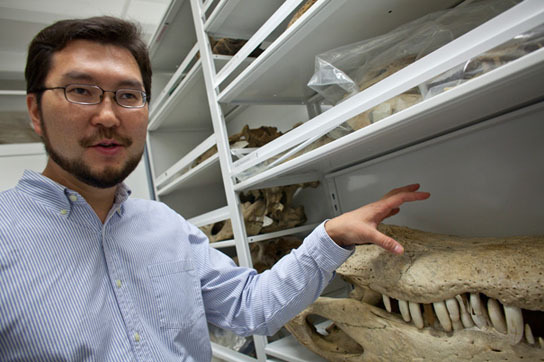 Ultimately, Abzhanov said, the way the bird skull evolved — through changes in the developmental timeline — highlights the diversity of evolutionary strategies that have been used over millions of years. 1 Comment on "Evidence Shows that Birds are Essentially Living Dinosaurs"
For example, snakes evolved from primitive lizards but it would be absurd to claim that snakes are lizards.